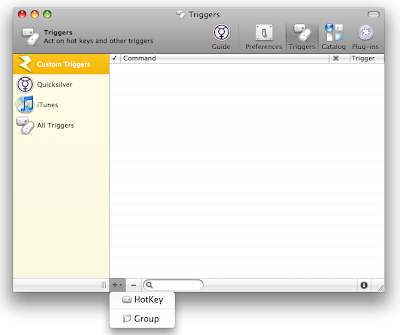 This is one feature that isn't directly supported by the otherwise extremely usable OS X. 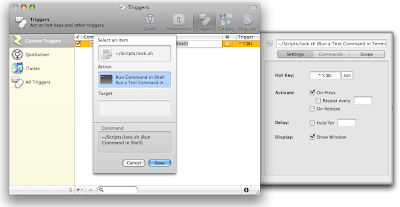 You can execute this script (remember to chmod u+x it first) via a keyboard shortcut by using QuickSilver triggers. Since it's easier to explain with screenshots, that's what I've done. Just remember that when you're selecting an item (shown in the last image), you need to hit '.' to clear the field so you can type in the path to your copy of lock.sh. What you are doing is too much work. Sudhindra, that's the article that I started my research with. I'm using option 3, fast user switching. I've tried all the other options but didn't like them much. 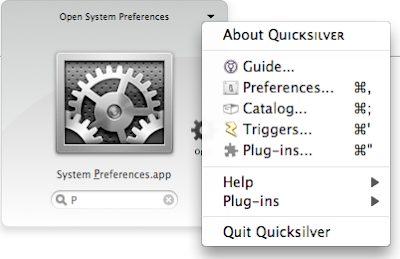 The only additional thing I'm doing is enabling fast user switching via a keyboard shortcut. I also found some other script to do this .. I am assuming even using your script the screen saver will come up, if configured such.